Now here's something I was not expecting. Previously, I tried to drive this stepper motor with the driver board that came with the motor. My main goal was of course keeping the accuracy of the tiny motor safe and then testing at which speed I could get the maximum torque it could produce. Depending on the driving method, I came up with 300gcm when it was driven using half stepping and 380gcm when I switched to full stepping. Those were actually good results considering that the datasheet predicted these numbers more or less. Now this kind of motor is not really up-to-date with modern technology. Unipolar stepper motors are not that common anymore. Bipolar steppers are twice as efficient with the same amount of copper on the internal windings. Even in full stepping mode, a unipolar stepper still has 2 out of four wires not active all the time. So basically, if there was a way to run current through all windings in the motor at all times, the thing would be stronger and faster. That's what happens in a bipolar stepper motor. 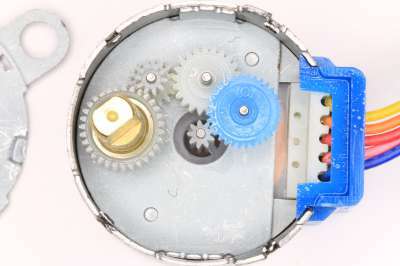 It has only two windings instead of four in a unipolar stepper. Both windings can be activated all the time, but their polarity is switched in four steps. This means that this kind of motor only has four wires instead of 5 (or 6 or 8). The tricky part is changing the polarity. That cannot be achieved by the simple driver board that came with this motor. It only activates one or two out of four outputs, but current always flows in one direction. What if we could change the wiring of this motor, thus converting it to a bipolar model? All you would need to do is cut the red wire in the scheme above and then ignore the center connection marked 2+3+6+7. The result would be something like the left drawing. I found out that this is very easy with this motor. All you need is a sharp knife and a tiny screwdriver. Use the latter to remove the blue plastic cap that hides a small PCB. On this PCB, you can see eleven solder points. All it does is fixate the wiring of this stepper (which can be either unipolar or bipolar by design) into a unipolar type by connecting the center of the two windings. If we cut this connection and ignore it in our scheme, what's left is a real bipolar stepper motor. This is what the PCB looks like in detail. The red connection in the scheme above is actually the copper connection in this picture that I cut with a cutter knife. That's all you need to do! Well, for your own peace of mind, you could also try to re-attach the blue plastic cover. And now, ignore the red wire of the motor. We don't need it anymore. But now we have a motor without a driver board. What you need is a H-bridge type which luckily exists in small packages if you're not going to drive heavy machinery. I used a L293D 16 pins DIP chip which I found online for $5.5 for ten chips. I drew up this scheme that I used to drive the motor with an Arduino (actually I used an Atmega8 on a breadboard doing exactly the same thing, only a bit slower). I'm using 9V on the motor in this test since windings are twice as long as in the original version. I guess you could go much higher than that, this thing never heated up in my test. My simple code example to drive it can be found here. Basically, if I cut one wire in the motor, it gains almost 3 times its original strength. Moest het nu juist één jaar vroeger zijn, dan was het vandaag vrijdag. Bye bye Aalst schreef ik hier en daarmee was de laatste werkdag bij de Vlaamse Milieumaatschappij een feit. Dat het mijn laatste werkdag tout court zou worden, kon ik toen niet voorspellen. Toch waren er toen al problemen met de gezondheid. Het is vreemd dat je zoiets vergeet, maar net vorige week nog werd ik er op attent gemaakt dat hoewel in mijn herinnering alles pico bello was in die periode, de waarheid toch een beetje anders was. Het tijdelijke contract was toen reeds twee maal verlengd, wat me natuurlijk blij maakte. Ik deed dat namelijk erg graag, dat programmeren in het verre Aalst. Alleen, die afstand hè. Maar een extra verlenging kwam er niet, en ik was toen blij. Blij omdat het niet meer zou lukken vanwege de rugklachten, tóén al. Een tijd later zou ik naar de dokter gaan om mijn usual stuff te vragen om de pijn weer actief te onderdrukken. Diclofenac is de ontstekingsremmer die ik in de periode tussen de twee operaties wel vaker nam. Niet altijd was het gevoel van wonderbaarlijke genezing aanwezig dat was blijven hangen meteen na de eerste operatie. Ik was recht gesprongen uit mijn ziekenhuisbed en kreeg meteen naar mijn voeten van de chirurg die dat toevallig had opgemerkt toen ie net op dat moment mijn kamer binnenkwam. Maar soms was dat dus toch nodig, zo'n medicijnenkuur en in november 2012 startte er dus weer één. Die zou niks meer helpen en vanaf januari zou ik zelfs werkonbekwaam verklaard worden. Daarna zou weer niks meer helpen en in mei zou er een operatie volgen. De revalidatie zou minder snel gaan en zelfs op een moment helemaal stoppen. Dat moment ligt ook al weer enkele maanden in het verleden en echt beterschap is er niet. Er is geen hernia meer, maar de pijn en de mankepoot zijn weer helemaal daar. Hoe het verder gaat, weet niemand. Misschien weet de chirurg dat volgende week als ie de uitslagen van de laatste botscan beoordeelt. Ik reken niet op duidelijke antwoorden, want die bleven in 't verleden na een botscan ook altijd uit, maar je weet nooit. Hoe het carrièregewijs verder gaat weet ik dus evenmin. Wat wel vast staat is dat de toekomst anders wordt. This is the English version of this earlier blogpost. Also check this blogpost on how to change the motor into a bipolar model with a lot more torque. This must be the cheapest stepper motor I know. I guess the reason why it's so popular among hobbyists is simple: its price. I don't know many real steppers cheaper than 20€ and if you find one, you still need to take into account that it usually runs at high currents, so driving the thing with a microcontroller takes some high power circuitry which again is way too expensive for my purposes. I just want to have some fun with small projects where torque and speed are not really main issues. Accuracy is, though! That's why I bought a whole bunch of these on AliExpress.com. If you buy larger quantities (which usually is the only option on that site), these babies only cost $2.5 each. That's even including this small driver board equipped with a ULN2003 chip. That little thing makes driving the motor with an Arduino real easy and really really really cheap. I found this datasheet which is actually describing the 12V version of the motor, but I don't see any difference between the two versions, other than its voltage. I prefer my 5V version though because it gives me the opportunity to use the thing in battery operated projects. There's no need for seperate power sources for the motor and the project that it belongs to. I also found this wiki page online with a lot of info on the motor. Using the driverboard on an Arduino is real easy. All you need is four outputs that connect to four of the seven circuits in the ULN2003 chip on the small board. Actually three inputs of the chip remain unused, you could even drive some extra high power things like a power LED or a relay with the board. The inputs are there (inputs 5,6,7) but accessing the outputs might be a bit more tricky. Now basically, all you should do is switching on the four outputs you defined in your Arduino program one by one. That's what makes the motor turn in on direction. Reversing the order would change its direction. If you repeat these steps about 500 times, then the motor should do almost one revolution. The word almost is a bit strange when used in this context, I'll try to clear that up a bit further. All this seems pretty straight forward and of course: it is. Too bad that it doesn't work that way. Ik had to search a bit further, because driving a thing like this (a unipolar stepper motor) can be done in a few different manners, as I found out later. My gut feeling was not wrong. It just doesn't work on this motor. 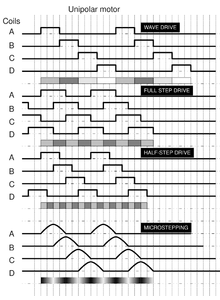 This table shows four different ways of driving a unipolar stepper, and the first one is called wave drive. That's what my initial thougts were, but again: it doesn't work with this motor. I tried it, but most of the time it didn't even start. When it did, there was no torque whatsoever and it made the little thing completely useless. Half stepping is what it should be according to the manufacturer. That's number three in this table. It's a bit more complicated, but not that big a deal. All you need to do is use 8 steps instead of 4. If you would name the wires A,B,C and D, then the scheme would be the following: first activate wire A, then A and B together, then only B, then B and C together... and so on. So half the time, there's one wire active and the rest of the time there's two wires active. It should give the motor the smoothest movement and that's probably the reason why this is what the datasheet recommends. Well, actually it just says to do it like this. There's no alterative in the sheet. According to this table, there's a better way if you worry about torque, because half stepping only provides about 70% of the maximum torque available. If you really want the full potential, try the second option called Full stepping. Get back to four steps, but this time always put a voltage on two of the four wires. The scheme would be AB, BC, CD an DA. This gives the motor its full torque. There's a fourth way to drive a stepper motor, that's using Microstepping. That takes expensive circuitry, so I won't bother about that for this page. But my first concern was definitely its accuracy and torque. Though moving heavy objects is not really my goal, the worst nightmare when driving stepper motors must be that the thing skips steps due to a heavy load. You probably wouldn't notice this phenomenon at first, but when you want to move an object at an angle of exactly 46,7° in one direction, then this is a major concern. The application that I have in mind for this motor requires this kind of accuracy, and if a part that only costs $2.5 could accomplish that, it would make me one happy camper. First of all, I measured one piece of important information. Its current is about 120mAmps in half stepping. Theoretically, that would take it to 160mAmps in full stepping, but I never measured this. But again, the major concern was torque and speed. A torque of 300 gcm (0,03 Nm / 4.25 oz inch - nice conversion website here) can be measured by applying 300g weight on a lever of exactly one cm distance away from the center of the rotor. This is not very convenient in real life, so I tried a lever of 10cm with a weight of 30g attached at the end. 300 gcm was no problem, but when I tried 350, the motor hesitated. It was missing steps, as you can see when it returned and pushed away the whole construction. These tests were done at a a speed of 333pps (pulses per second in some datasheets) or 3ms delay between pulses. At this speed, one revolution takes 12.6 seconds. I tried to speed things up to 500pps (2ms delay between steps), but then the motor also failed the test. The maximum speed without any load was 800 pps (1.2 ms delay or 5.0 seconds for one revolution). At higher pulses, the motor just stopped. I also tried full stepping when no camera was running, and I found that 380 gcm was its maximum torque at 333 pps (3ms delay). Those numbers produce the absolute max torque this motor can produce (when connected as unipolar with the driver board that's included, check this blogpost to see how I converted this motor into a bipolar model, which increased its torque even more dramatically!!). Why full stepping is not the preferred method is not clear to me, it just says so in the datasheet. I found no downside to this method, the motor does not seem to make more noise or run less fluently than in half stepping. The number of steps in one revolution is a bit of a mystery to me. I found different numbers online, but all tests I did resulted in 508 or 509 steps for one revolution. 508 doesn't really make a complete turn, and 509 overshoots the 360° a bit. The truth no doubt lies somewhere between the two. What bothered me was the fact that it's not an integer value. Probably this is due to the fact that these motors are geared internally. Also, there seem to be a few versions of the motor on the market and not all models seem to have the same gearset inside. I found this topic that talks about this strange phenomenon. Another really major problem is the fact that I measured a lack of almost 6° when the motor changes direction. This problem is huge when I need to be as accurate as I mentionned earlier. There's an easy solution though, and I plan to make a manual correction with the software that drives the motor. My plan is to always move the motor in one direction for accurate positioning. If I do need to move back, I'll overshoot 10° and move back. This keeps the gears always positioned in one exact direction. I wrote some very simple Arduino code, which you can find here. Four functions define the two methods half stepping and full stepping. You can choose to test one function by uncommenting it in the major loop(). The half stepping functions are called forwards() and backwards(), full stepping is accomplished by uncommenting forwardsFull() or backwardsFull(). It may be a good idea to set all outputs back to LOW afterwards (function motorOff()). De maat was vol. Het moest nu maar eens gedaan zijn, had ze gezegd. Dat ie maar eens terugkomt als ie wat langer nuchter is, want zo kan het echt niet meer. Eentje maar, één karakterfout was de aanleiding. Later noemde ik het in een moment van herkenning 'het grote foert-moment'. Als ik arrogant mag zijn, noem je dat goede raad geven. Anders hou ik het liever bij ervaringen delen die ik heel goed ken. Maar dat is o zo groot, die herkenning. Het potje kookt over en het enige wat ik kon doen is weglopend iets roepen over een pot die je op kunt. Misschien denk ik dat alleen en zijn die woorden er niet echt. Maar steevast wou dat vroeger zeggen dat de concentratie alcohol die avond hoger lag dan andere avonden. Het tempo waarin het steeg, ook. Wie denken de anderen wel dat ze zijn? Er zijn limieten aan wat ik aanvaard, en dit pik ik dus niet. Foert! Toch is er iets vreemds. Ik zeg dat ik dat nu niet meer zo heb, en dat blijkt niet waar te zijn. Ik heb mijn mond vol over hoe ik veranderd ben en hoe ik mijn karakterfouten heb aangepakt zoals dat trouwens staat ergens in een stap van ons programma. Het is een stap tussen vier en tien, maar ik weet niet dewelke. Maar ik ken die range omdat ik altijd beweer dat ik enkel één tot drie en elf en twaalf gedaan heb. Dat blijkt dus ook al niet te kloppen, want deze stap zit ergens in mijn todo reeks. Maar dat is de kritiek. Hij is gegrond, want net vorige week liep ik weg van een discussie. En dat moet ik beamen, want ik herinner me het goed. Toch was het helemaal anders, want mijn promille veranderde niet die avond. Het potje kookte trouwens over omdat het al behoorlijk vol was, en dat herinner ik me ook. Ik heb zelfs het fundament van de kritiek ingezien en aanvaard. Het is niet omdat kritiek me boos maakt dat ie niet gegrond is. En binnen 24u heb ik de basis van de kritiek dan ook aangepakt. Het probleem is nu trouwens van de baan, terwijl ik vroeger koppiger nee bleef zeggen in mijn eigen wereld waar hoogstens één persoon gelijk had. Eén van die stappen staat daar nog. Ergens tussen vier en tien. Maar lees ze eens heel goed. Luister eens heel goed naar wat de anderen zeggen. Het boekje met de stappen is geen bijbel. Mensen zitten een half leven lang aan dezelfde tafel zonder ze allemaal te doen. Het zijn suggesties, levensvragen die een antwoord krijgen en die je mag lezen als je dat wil. Weet alleen dat ze er staan en doe er iets mee als je er klaar voor bent. Of doe er niks mee en geef er een draai aan. Draai net zo ver tot de factor alcohol weg is uit het 'foert' moment. Voor mij is dat nu voldoende. Ooit leer ik ze misschien nog af, maar haastig ben ik niet. Want mijn 'foert' moment is nu droog, en dat vind ik al een levensgroot verschil. Geef nu gewoon toe dat ie er mooi uitziet. Ik weet dat wel hoor, het is de kleur die een vijftienjarig meisje zou kiezen. Maar op deze website (tallygear.com) kan je veel opberghoesjes vinden voor je Dexcom glucosesensor. Ik had er al langer last mee, en omdat ie niet beschermd was, is er zelfs al een kras in het scherm gekomen tijdens onze Ardennen geocache. Da's jammer, maar gelukkig zit ze op een plaats waar ik nooit moet kijken op de grafiek. Boven 350 ben ik nog nooit geraakt en ik hoop dat zo te houden. En met mijn Dexcom (en mijn stabiel lijf, suikergewijs dan toch) heb ik de juiste tool om het niet zo ver te laten komen natuurlijk. Nu dus goed beschermd: je kan het met die clip aan de lits van je broek hangen, de achterflap kan je door een broeksriem halen of je kan hem rond je nek hangen met het bijgeleverde zwarte lint. Een aanrader ! Een vreemd gevoel was dat toch en het duurde een hele poos. In 't Engels zeggen ze gut feeling, hier zou je kunnen zeggen dat je 't voelt aan je water. Maar er was dus iets mis. Ik lig dus onder de scan vandaag omdat het rugprobleem maar niet opgelost geraakt. De chirurg stuurde me na de vorige afspraak verder naar de kelder van Sint Augustinus omdat de MRI scanner op de gelijkvloerse verdieping geen defecten zag. Op de afspraak zag ik het zelf, het voordeel was dat er nu een voor en na foto was. Voor en na de operatie zag je nu duidelijk op de MRI dat er wel degelijk toen een hernia in de weg zat en nu is die dus weg. Maar voor de rest is de scan niet problematisch. Het verslag van de radioloog sprak wel over defecten die we al langer kenden en ze zijn er nu nog. Maar die zijn niet van die aard dat je er last van kan hebben, zo lees ik de woorden. Ik hoor wel een dramatische opbouw tegen de scan van drie jaar geleden, nog voor mijn eerste operatie. Toen waren er ook al meldingen van problemen boven de tussenwervelschijf die nu behandeld was. Maar niet van die aard om er last van te hebben. Nu dus ook niet, maar ik vind de uitleg minder geruststellend dan die van toen. Maar dat was niet wat ik nu voelde aan mijn water. De botscan begint en de camera beweegt traag vanaf mijn hoofd naar beneden. Er wordt een volledig beeld genomen denk ik dan, misschien zal men later meer in detail gaan in de onderrug. Toch duurt die opname 20 minuten en ik vind dat dus vreemd. Na die tijd wordt me uitgelegd dat de dokter de foto zal bekijken en dan beslissen of er meer detail nodig is. Ik wacht dus af, maar meteen verschijnt de arts in kwestie naast me aan de bewegende tafel. "U bent hier toch voor klachten in de lage rug?" vraagt ie me. Ik kan dat natuurlijk alleen beamen, maar de vraag baart me zorgen. Je zou toch denken dat de persoon achter de knoppen dat detail wel weet? Niets is minder waar als ik plots van achter de glazen wand de volgende woorden hoor: "Aaaah, dat is lumbaal of wa?". Ik ben geen dokter maar dat woord ken ik natuurlijk ondertussen. De vijf onderste wervels noemen dokters lumbale wervels. 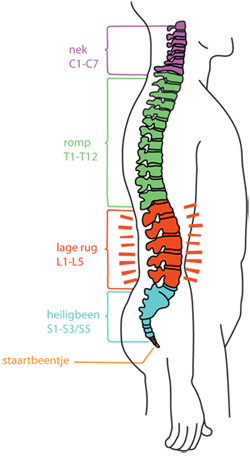 Daarboven zitten een hoop thoracale en in je nek heten ze cervicaal. De scan is dus verkeerd en ik word gevraagd om me wat anders te positioneren op de bewegende tafel. Het kussen moet weg en er komt een rolkussen onder de nek. En dan komt er een nieuwe scan om meer detail te zien, dat is toch het verhaal dat in mijn gezicht verteld wordt. Dat zal ook misschien wel zo zijn, maar ik weet intussen dat de eerste foto's dus op de verkeerde lichaamsdelen nadruk hebben gelegd. Na de scan vraag ik de dame die alle uitleg gaf over hoe ik me best positioneer op de tafel waar het misverstand nu zat. Veel antwoord krijg ik niet, en ik richt me op de heer die van achter zijn scherm is gekomen. Ik vraag hem op de man af of er nu het woord cervicaal op zijn blad stond en dat bevestigt hij. Ik zeg nog dat dat niet erg is, want ik weet ondertussen dat er een fout zit in mijn dossier. Ik vraag hem nu om die fout recht te zetten, maar hij heeft die bevoegdheid niet. Ik krijg alleen de goede raad om uit te kijken welke delen ze later nog fotograferen. Hoe ik dat dan al wist? Ik kwam bij de controledokter van de mutualiteit een tijdje geleden en zijn eerste vraag toen ik binnenkwam was: "Hoe gaat het nu met uw nek?". Mijn antwoord was vervelend, want ik was dus daar om te bevestigen dat ik te veel pijn had om te kunnen werken. En mijn antwoord was dus dat er niks mis was met mijn nek. Gelukkig was het misverstand snel uit de wereld en geloofde hij meteen dat mijn probleem echt wel lager zat. Maar toen zag ik dus mijn dossier op zijn computerscherm en dat zegt letterlijk: cervicale hernia. Eentje in je nek dus. Ook hij kon dat dossier natuurlijk niet aanpassen, maar het is wel vervelend. Ik zal dus inderdaad best op mijn qui vive blijven bij de volgende onderzoeken ! Uiteraard is daar aardig wat werk in gekropen, maar het is dan ook een project waar ik een hele tijd geleden al mee startte. Verder was het natuurlijk vooral solderen, programmeren en zelfs één keer spelen met een laser. Waarom dat nodig was, kan je onder andere zien in dit 'making of' filmpje. Omdat er best wel wat verschillende instellingen zijn die je eerst nodig hebt om zo'n filmpje te maken, heb ik de software zo geschreven dat je eerst moet kiezen welk soort film je wenst. Afhankelijk van de keuze in het hoofdmenu is dat Youtube, Animated GIF of Fotoshoot. De menuutjes die dan volgen verschillen nogal omdat je bij de Youtube-optie echt wel in termen van een film moet denken, dus met een aantal frames per seconde en een tijdsduur. Bij een animated GIF is dat helemaal niet zo, want dan is het software op de PC die de foto's in een bepaalde volgorde gaat tonen. Je kan op dat moment ook nog bepalen hoe lang elke foto moet getoond worden. Toch is het belangrijk om dit op het moment van het nemen van de foto's al juist te plannen. Het is immers zo dat je enkel de tijd dat één foto in beeld is kan wijzigen op de PC, maar de hoek niet meer omdat de foto al genomen is. Daarom dus een redelijk complexe menustructuur waar je bijvoorbeeld moet zeggen of je een normale rotatie wil tonen of een versnelde. Een normale rotatie laat een object met een constante snelheid ronddraaien, terwijl een versnelde rotatie een variabele snelheid heeft zoals die in de vorige pagina in de voorbeeldjes te zien was. De lightbox zal voor elke foto berekenen hoe groot elk stapje moet zijn om zo'n versnelling en vertraging rond een 'rustpunt' juist in beeld te brengen. Daar zit dus behoorlijk wat rekenwerk achter. 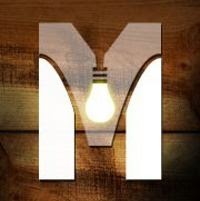 In dit filmpje heb ik een kort overzichtje gemaakt van de mogelijkheden van de lightbox op basis van de menu's die ik in het toestel heb geprogrammeerd. Alles is trouwens in C++ geprogrammeerd (of gewoon C zoals je wil) omdat ik nog steeds de Arduino omgeving gebruik. Deze pagina heeft wellicht eventjes tijd nodig om te laden, maar na een paar seconden zouden de 360° voorbeeldjes toch vlotjes moeten bewegen. Ik heb drie manieren gevonden die me nuttig leken om de foto's die de Lightbox 360 genereert om te zetten naar bewegende beelden. In het ontwerp van de software van de box hield ik daar al rekening mee, zo zal je zien dat de eerste keuze in het hoofdmenu direct het onderscheid maakt. Ze zijn namelijk nogal fundamenteel verschillend en ook bij het maken van de foto's is dat al van belang. 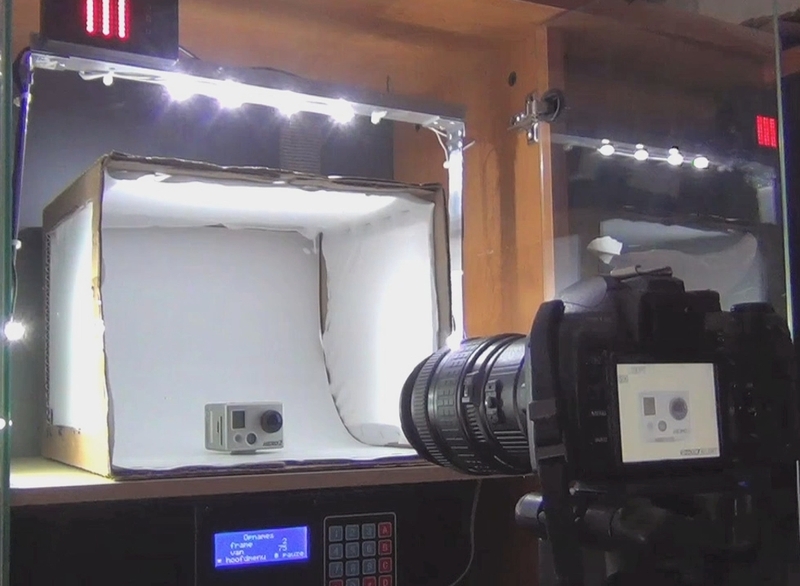 De eerste manier is de eenvoudigste: neem gewoon alle foto's die die Lightbox 360 heeft gemaakt en plak ze aan elkaar in een Youtube filmpje. Als de kwaliteit van het beeld een belangrijk punt is, zal dit ook de beste optie zijn. Maar er zijn wel enkele nadelen aan verbonden. Zo kan je geen kant op met een gewoon filmpje buiten op play of op pauze drukken. Er is geen controle over wat er precies getoond wordt, alle beeldjes worden met een rate van 30 frames per seconde op het scherm getoond. Stel dat je even het beeld zou willen stilzetten om een object in detail te bekijken, dan heb je voor 5 seconden beeld dus 150 exact dezelfde foto's nodig. Dat is een beetje dom natuurlijk. Toch is het de beste optie voor de beeldkwaliteit. Het volgende filmpje toont na elkaar drie mogelijkheden van de Youtube optie van mijn Lightbox 360. De eerste is gewoon de beelden met een vast interval na elkaar tonen. Het GoPro cameraatje in beeld zal met een constante snelheid draaien. De tweede optie is mooier, want ze toont de camera meer in detail aan de voorkant en aan de achterkant. Er werden meer foto's genomen bij 0° en bij 180° rotatie en daardoor vertraagd het beeld om de voor- en achterkant beter te tonen. Maar in dit specifieke voorbeeld vind ik optie 3 de beste. Ze toont geen twee maar wel drie 'rustpunten' zodat je ook opzij de camera mooi in beeld krijgt. Het hangt een beetje af van het object dat je in beeld brengt of je 2,3 of zelfs 4 rustpunten wenst in te bouwen. De echte bestaansreden van de box is echter niet de Youtube manier wel de tweede manier: Animated GIF. Ik wil op mijn blog vooral duidelijke foto's met meer controle over de beweging die je ziet. Een Animated GIF geeft de mogelijkheid om elk beeld (frame) een bepaalde tijd in beeld te brengen. Je kan dus één frame enkele seconden tonen, en dan 20 snelle frames tonen om het object te doen bewegen. Geen 150 verloren frames dus, je hebt slechts één frame nodig bij een stilstaand beeld. Dit is eigenlijk exact wat ik wou bereiken met mijn box. De foto is geïntegreerd in de alinea en je ziet geen randen zoals dat in een filmpje wel is. Een Youtube filmpje blijft toch altijd een beetje in een apart schermpje draaien en het verstoort de layout van de pagina. Deze foto toont enkele seconden de voorkant van een display van een Nokia GSM. Dan draait ie snel 180° en dan zie je twee seconden de achterkant. Ook die twee seconden zijn dus maar één frame. In totaal zie je hier slechts 50 frames, waar dit in een filmpje al gauw enkele honderden frames zou nodig hebben. De kwaliteit is slechter dan in een Youtube filmpje. Een Animated GIF kan immers slechts 256 kleuren tonen in één frame en naar huidige normen is dat niet voldoende meer. Toch valt het in dit voorbeeld mee, omdat wel elk frame een andere set van 256 kleuren heeft. Zo zullen de frames die de achterkant van de Nokia display tonen vooral tinten blauw en wit nodig hebben. Men maakt gebruik van dithering om het kleurenpallet wat vloeiender te krijgen, maar dat gaat ten koste van de beeldresolutie. Toch vond ik dit voorbeeld van mijn Dexcom glucosesensor erg goed. Zeker goed genoeg om op een blog te tonen. Ik moet zeggen dat ik behoorlijk trots ben om mijn nieuwe 'uitvinding'. Het ding dat ik Lightbox had gedoopt, had ik al een tijdje intensief in gebruik en ook de details van hoe ik de PowerLED lichtbrug had gemaakt om de katten te verlichten kwam hier al ter sprake. Ook de besturing met de nodige dimmers die ik met een microcontroller aanstuurde, kon je al bekijken op deze blog. Maar de échte bedoeling was toch meteen al in mijn hoofd geschoten nog voor de originele Lightbox klaar was. Zou het niet mooi zijn als je niet alleen foto's kan nemen, dacht ik toen al. De basis van de opstelling die de bewegingen bestuurt zit in de zwarte behuizing onder het schapje van mijn boekenkast. Merk trouwens op dat ik zelf een schap op maat heb gemaakt om mijn boekenkast niet te vandaliseren. De basis is mijn BasicBoard dat ik lichtjes moest aanpassen om een stappenmotor te besturen in plaats van servo's. Ik heb ook wat componentjes bijgevoegd om het op een netadapter aan te sluiten in plaats van de batterij in het originele concept. Op het printje komt een Atmega8 microcontroller in SMD formaat die alle logica zal uitvoeren (ik blijf trouw aan de Arduino omgeving en dit zou dus exact op dezelfde manier kunnen met een standaard Arduino). Er is een beetje koeling voorzien voor een kleine spanningsstabilisator in de vorm van wat extra koper aan de rechterzijde. 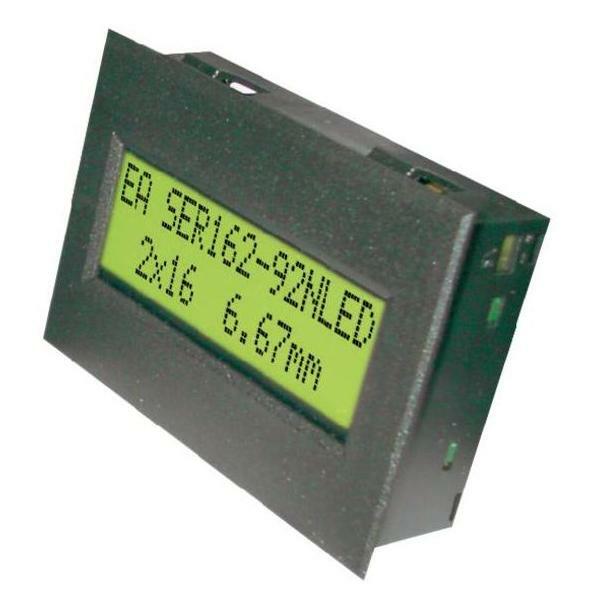 Een blauwe display met vier regels, een toetsenbord met 16 toetsen en een SMD buzzer verzorgen het menselijk contact. In de box zit een klein printje dat ik kant-en-klaar in China bestelde om deze kleine stappenmotor te besturen. Vooraan plug ik een kabel in de zwarte doos die het fototoestel bestuurt. In de box zitten 2 relais om de functie 'half indrukken' en 'volledig indrukken' van de sluiterknop van het fototoestel op deze manier na te bootsen. Wat is nu mijn doel in mijn leven? Waarom ben ik hier op deze aardbol gezet en hoe wil ik me vanaf nu nuttig maken? Die vragen gingen door zijn hoofd toen Michael Niclaus in juli 2011 besliste om vanaf dan geen alcohol meer te drinken. Ooit vind je de job van je leven en dan ben je weg. Dat deed ie toen ie in het begin van dit jaar besliste om van deze beslissing , zijn beste beslissing (http://www.debestebeslissing.be) zijn werk te maken. Nu is hij alcoholconsulent en geeft ie persoonlijke begeleiding aan mensen die willen stoppen met drinken. Hij geeft ook lezingen in scholen om jonge mensen te inspireren om hun eigen doel te vinden. Als ervaringsdeskundige wil hij waarschuwen hoe alcohol daar vaak een stokje voor steekt. En daar heeft ie dit filmpje over gemaakt, wat natuurlijk zo vaak mogelijk gedeeld moet worden. Echt veel nieuwe info was er niet vandaag. Dat is een beetje jammer, want de afspraak was al vijf weken geleden gemaakt. De chirurg die mijn Dynesys heeft geplaatst heeft het niet alleen heel erg druk, hij ging ook net op vakantie toen ik opnieuw klachten kreeg. Ze zijn anders deze keer en dat wordt bevestigd door de resultaten van de MRI scan. De scan toont geen nieuwe hernia, dat kon ik met mijn eigen ogen zien. Je kan nu trouwens wel heel erg goed zien wat er vorige keer gebeurd is op de operatietafel. Naast het plaatsen van de Dynesys was er immers weer een hernia, hoewel dat door de radioloog die toen het plaatje maakte niet bevestigd werd. Dat er iets te zien was, daar was iedereen het over eens. Dat het een hernia was, niet. Andere opties zijn mogelijk en toen dacht hij vooral aan littekenweefsel van de vorige ingreep. De chirurg keek natuurlijk live naar het ding dat me de pijn bezorgde en hij zag wel degelijk een hernia. Nu is er een 'voor' en 'na' foto zoals in reclamebrochure voor vermageringspillen. Je ziet heel duidelijk dat de 'na' er veel properder uitziet. Maar weten wat het niet is, dat is een beetje teleurstellend na een bezoek aan een chirurg. De verwachting is altijd te hoog, dat weet ik wel. Dat er echt iets is, daar is hij wel van overtuigd. Dat komt niet alleen omdat ie mijn klachten dat het weer veel pijn doet wel gelooft, de aard van de klachten baren hem ook zorgen. Ik heb een geblokkeerde rug en dat is iets anders dan een hernia. Het voelt ook anders aan, want de nadruk van de pijn ligt in de rug op de plaats van de operatie. Bij de hernia was er vooral pijn in de voet en die is nu veel minder. Ze is er nog, maar veel minder. Een geblokkeerde rug is geen reden om een chirurg aan te spreken, maar de reden waarom wel. Elke paar dagen of ten minste één keer per week voel ik een scherpe, stekende pijn op de plaats van de operatie. Daardoor spannen alle spieren op en dan blokkeert de rug. Dat duurt telkens een aantal dagen en dat gaat vanzelf weer over. Maar tegen de tijd dat het wat betert, voel ik die pijn opnieuw. En dat is nu al zeven weken lang. Het spreekt voor zich dat zoiets wél thuishoort in dit dokterskabinet. Ik kan zijn gedachten niet lezen, maar ik voel wel aan dat het wellicht niet goed zit. Wellicht daarom volgt er nu een botscan in de kelders van Sint Augustinus op 22 oktober. Op 5 november zie ik de chirurg terug. Ik hoop echt dat er iets zichtbaar verschijnt op de scan. Het idee dat het wordt geklasseerd als een vage klacht baart me altijd zorgen. Tot nog toe is dat nooit gebeurd, maar het idee dat ik zou moeten leven met deze medicijnen is me te akelig. We zitten op 2 keer 20 mg Targinact per dag en af en toe vul ik de 'gaten' tussen de periode van 12 uren die ze moeten overbruggen maar dat niet echt kunnen, met Brufen. Het is zeker niet de eerste keer dat dit hier staat neergeschreven. Omdat ik heel erg geloof in toeval, moet ik nu herhalen wat er stond. Ik weet trouwens al langer dat het geen toeval is, en net daarom is het goed om er bij stil te staan. Straffer nog: het is zelfs van levensbelang. Twee keer was er ineens een droom die blijft hangen. Vaak gebeurt dat niet, meestal is je brein zo slim om eens je wakker wordt op de resetknop te drukken. Anders zou je altijd in die andere wereld leven en dat is nu net niet de bedoeling. Ik geloof niet dat dromen iets betekenen. Ik geloof niet dat er een verborgen boodschap in zit van God. Maar ik weet inmiddels wel dat elke keer als ik riskeer om niet naar de AA te gaan, ik dat op één of andere manier ergens begin te voelen. Ik dronk van een glas witte wijn na een maaltijd. De tafel was net afgeruimd op de glazen na en het bezoek was in de keuken aan het helpen. Lege flessen stonden verzameld aan het aanrecht. Ik zat dus alleen aan tafel en vergiste me van glas. Als er bezoek komt, drink ik water uit wijnglas en dan is de fout snel gemaakt. Ik herinnerde me de smaak en ik proefde meteen hoe het vroeger was. Er was geen extreme plotse drang naar alcohol en echt lekker was het eerlijk gezegd ook niet. Maar één ding was anders. Omdat ik het op die manier aanvoelde, dus zonder drang naar meer en zonder overdreven enthousiasme omdat ik dat zo lang gemist had, veranderde er iets. Ik dacht plots dat alles helemaal zo erg niet was. Ik wist ineens dat ik gewoon een glas wijn aan tafel kon drinken zonder dat ik de hele fles en de twee volgenden ook wou. Of het echt zo was, weet ik niet. Toen werd ik immers wakker, en ik moest er meteen om lachen. De tweede was gewoon vreemd. Elke nacht rond een uur of vijf werd ik wakker. Ik dronk wodka uit een klein plastic flesje. Geen beetje hè, echt een serieus paar flinke slokken. Ik deed het omdat ik dan weer in slaap geraakte zonder angstige gevoelens te hebben. Het is een samenraapsel van ervaringen, zoals dat altijd zo is met dromen. Maar deze waren zo echt omdat ze het heden meenamen in de droom. Ik lag namelijk echt wakker om 5u 's ochtends door pijn in de rug. En vroeger lag ik echt wakker omdat de alchol was uitgewerkt en de kater begon. Ik deed dat toen soms, enkele flinke slokken wodka drinken. Zo kon je 'normaal' uitslapen tot een uur of 9, zonder dat je nevenwerkingen had. Kritiek die ik hoorde op de AA: daar word je gebrainwasht. Het zijn fundamentalisten. Het is kritiek van andere mensen die toegeven van een drankprobleem te hebben, maar niet naar de AA willen gaan. Ik deel de kritiek maar ik ben er blij mee. Deze week verscheen er een onderzoek waaruit bleek dat kinderen die naar een sportclub gaan twee keer zoveel alcohol drinken dan kinderen die dat niet doen. Als ze ouder worden en het echt menen met hun sport, dan vermindert dat. Maar de meerderheid van de kinderen blijft de sport op niveau van de liefhebber doen. Die meerderheid is dus getraind om alcohol te drinken na de sportieve prestatie. Dat hoort er gewoon bij want papa en mama geven het goede voorbeeld in de kantine. Het onderzoek was daar en Facebook ontplofte door de kritiek van de ouders op de aanbeveling om alcohol in kantines te verbieden als er kinderen aanwezig zijn. Ik weet niet of het een goede oplossing is, want verbieden werkt vaak averechts. Maar de houding van de ouders bleef hangen. Zij zijn het die de kinderen aanleren dat alcohol bij sport hoort, terwijl er geen enkele objectieve link is tussen die twee. Dat heet brainwashen. Genoeg voorbeelden in mijn directe omgeving. Stel je het veldrijden voor zonder alcohol. Ik weet niet of je er ooit geweest bent, maar wat ik hoor van de jaarlijkse rit in de Noorderkempen, dat heeft weinig met sport te maken. De atleten zijn wellicht de enige nuchtere aanwezigen op het ganse terrein. Of de grote rode hoeden met daarop een hamer en het opschrift 'Jupiler' die blijkbaar overal aanwezig zijn als camera's supporters filmden verspreid over het hele land toen ze België in Kroatië zagen winnen. We weten toch allemaal dat voetbal en een pintje Jupiler onmiskenbaar gelinkt zijn. Is dat echt zo? Hoe zou dat dan komen, want ik voel het niet zo aan. Ik heb van de match echt genoten, meer dan vroeger zelfs, toen ik zelf de match bekeek in de hoop dat ze zouden winnen om dan helemaal in de Jupiler te vliegen. Ladderzat zijn op een voetbalavond is niet erg. Maar waar zit die link? Zie jij Lukaku of Courtois op het veld een pintje drinken misschien? Als ik honderd mensen zie die allemaal zeggen dat het normaal is, kan ik niet anders dan het na een tijd gaan geloven. Daarom heb ik er tien nodig die elke donderdag zeggen dat het niet normaal is. Is dat brainwashing? Ja. Dat is wat die tien doen. Maar wat die honderd doen, is net hetzelfde. Ik wil een CNC freesmachine! De prijs valt tegenwoordig nogal mee hoor. Er is veel keus en een goeie standaardmachine kan je wel ergens vinden voor 5000€. Gelukkig kan je tegenwoordig als je handig bent dat ook zelf maken. Voor een kleine 1000€ aan onderdelen ben je wel gesteld. Alleen ja, mijn budget is lager hè. Ik heb ongeveer 0€ te besteden, en dan wordt het al wat moeilijker. Ik bedoel dan enkel het gat waar de display in past. Het kan uiteraard niet zo mooi met zo'n kleine verfijning naar de display toe, maar dat kan je met een CNC freesmachine wellicht ook niet. Ik weet dat niet, want ik heb er geen in huis. Maar alleen al een mooi rechthoekig gat maken in mijn plastic behuizing waar mijn display in past. Zo, de lat is lager gelegd en dat moet ik wel aankunnen. Alleen dat budget hè. Nul euro is niet veel. Hier is het mee gelukt. Ja, dit dom stukje hout is de oplossing. Je moet even wat verbeelding gebruiken en er wat apparaten bijdenken die een doe-het-zelver al in huis heeft natuurlijk. En het ene past natuurlijk niet in het andere. Ik moet dus die Dremel (die geen echte Dremel is), in dat statief van de boormachine krijgen, dan zou ik al een stap verder zijn. Je kan immers nooit met de losse pols een rechthoekig gaatje maken in een plastic doosje. Ik kan dat toch niet, misschien mis ik gewoon de skills. Maar als de Dremel al in een statief zou staan, dan kan je al veel nauwkeuriger werken. Eerst heb ik natuurlijk geprobeerd om de Dremel er gewoon in vast te vijzen, maar dat lukt niet. 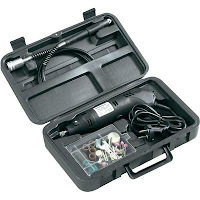 De Dremel is te dik voor de houder van de boormachine. Dan heb ik dat verlengstuk gebruikt dat bij de Dremel zit en dat past in dat stukje hout. Dan lukt het dus wel, en dankzij het sleufje in het hout kan de cirkel samengedrukt worden. Net genoeg om de Dremel met verlengstuk in de houder van de boormachine te klemmen. Een tijdje geleden kwam er eindelijk opnieuw schot in de zaak. En nu was het dan eindelijk zo ver. 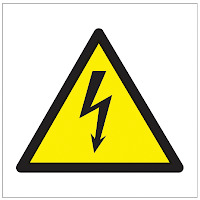 Het vorige verslag van de keuring van de elektriciteit in ons nieuw - oud appartement stond bomvol opmerkingen. Dat voorspelde dus niet veel goeds als er opnieuw iemand langskomt om hetzelfde soort verslag te maken. Natuurlijk hebben we alles er aan gedaan om het nu in orde te krijgen, maar je weet toch maar nooit. De ochtend zelf was ik nog bezig met de laatste aanpassingen aan de kabelgoten in het Agora-stuk, zoals dat hier heet. De drie slaapkamers die we ombouwden tot twee ruimtes die samen één kantoor vormen, hebben ondertussen niet meer echt die functie. Nu is het meer de speelkamer, het computerlokaal of de mancave. Dat laatste is de laatste tijd meer van toepassing. Ja, dat bestaat ook in een gay appartement en nee er worden dan geen twee mannen in toegestaan. Het 'laat me met rust'-principe bestaat ook hier zoals in elke mancave. Maar zoals dat hoort in een echte mancave gelden er andere regels. Poetsvrouwen zijn niet toegestaan en opruimen gebeurt op aangeven van de holbewoner die de mancave in gebruik heeft. Dat wil ook zeggen dat de structurele aanpassingen niet hetzelfde tempo volgden zoals die voorzien werden in het stappenplan van de rest van het appartement. En daarom is er dus nog werk aan de elektriciteit de ochtend vóór die gekeurd wordt. De keurder trekt zich namelijk niks aan van die indeling, voor hem zijn het gewoon vijf slaapkamers zoals dat op het plan staat. Nu is dat niet helemaal correct hoor. Mensen die elektriciteit komen controleren zijn immers per definitie mensen met die ene bepaalde interesse. Dat was ook meteen duidelijk toen ie de kamers met die functie betrad. Dat ik precies wel goed was uitgerust, amai! In de hoop dat er dan even niet al te nauw gekeken wordt op de kleine technische afwerkingen die naar mijn mening niet door een keuring geraken, heb ik dat beaamd. Het was ondertussen ook al duidelijk dat ie niet van plan was om alle contactdozen open te draaien om na te meten of het schema wel klopt. Dan zou ie trouwens een dag of twee moeten uittrekken, en dat soort termijn past niet in het vaste patroon van zijn aantal keuringen per dag. Alleen al het feit dat er twee zekeringkasten waren en één hoofdkast buiten het appartement, maakte het al moeilijk genoeg waarschijnlijk. Nu wil ik zeker niet gezegd hebben dat er fouten zitten in de bekabeling die nu door de vingers werden gezien. We spreken dan eerder over materialen die je moet afwerken volgens vaste regels, maar een oud appartement beperkt je een beetje in de mogelijke opties in die richting. Wij moesten het stellen met de draden die al in de muur zitten, en als er soms één te weinig was, hebben we compromissen moeten sluiten. Maar er telt maar één ding als de man de deur weer dichttrekt: we zijn gekeurd ! This page is written in Dutch. The English version can be foud here. Wellicht is dit de meest verkochte stappenmotor ter wereld onder de hobbyisten. Daar is maar één enkele, doch zeer goede reden voor: de prijs. Een echte stappenmotor die naam waardig kost al gauw 20€ zonder besturing. Als je die apart moet aanschaffen en de kosten van een degelijke goede voeding rekent, kom je al snel aan 50€. Het spreekt voor zich dat het voor de meeste toepassingen die in de hobbysfeer zitten niet haalbaar is. Zeker niet als je meer dan één motor nodig hebt. Of als je zoveel plannen hebt dat je best een lot van tien stuks bestelt. Op AliExpress.com kocht ik hier zo'n lot aan 2,5$ per motor, dat is inclusief het driverbordje. 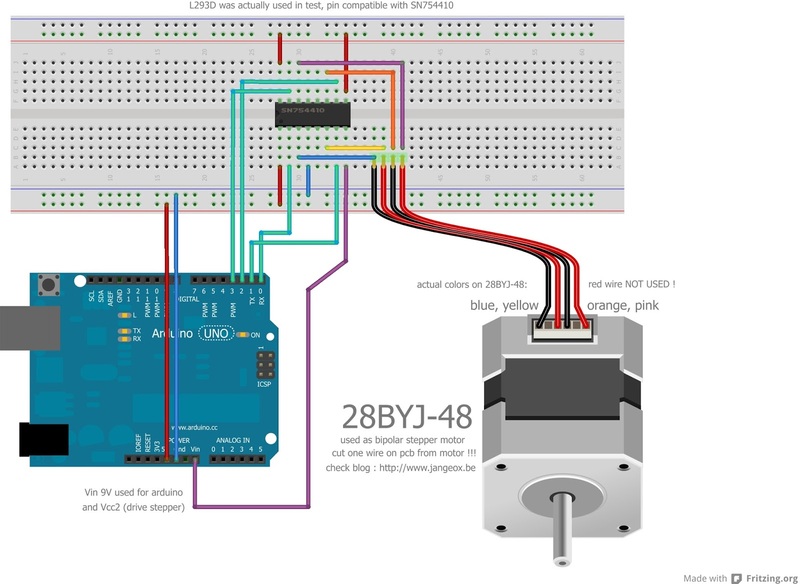 Je kan de motor via het driverbordje aansluiten op een Arduino of eender welke microcontroller. Het driverbordje bevat een ULN2003 chip. Het enige dat die doet is de vier kanalen meer stroom geven omdat een standaard uitgang van de Arduino slechts 40mA kan jeveren. Vier uitgangen van je Arduino sluit je aan op het bordje en die kan je dan één na één onder spanning zetten waardoor de motor één stapje zal maken in één richting. Doe je dit zo'n 500 keer na elkaar (niet exact 500, zie verder), dan heeft de motor één omwenteling gemaakt. Als je de volgorde omkeert, zal de motor in de andere richting draaien. Iets wat op 't eerste zicht erg simpel leek, bleek toch heel wat voeten in de aarde te hebben. Er zijn namelijk enkele manieren om dit soort motor (een unipolaire stappenmotor) te besturen. Mijn buikgevoel zei dus om het op de manier die ik net beschreef te doen. Dat is wat men in deze tabel wave drive noemt. Voor deze motor is dat heel simpel: het werkt niet! Als de motor al enige moeite deed om te starten, dan gaf hij geen enkele kracht en hij was sowieso nutteloos met deze sturing. Dan heb ik toch maar de manier gevolgd die in de datasheet staat. Half stepping is de derde in de tabel. Je gaat nu 8 stappen doen in plaats van 4. Het is de meest elegante manier om de motor te laten draaien. Als je even de draadjes A,B,C en D zou benoemen, ga je eerst A activeren, dan A en B samen, dan B, dan B en C samen, enzovoort. Je zal dus de helft van de tijd 2 draden onder spanning zetten en de andere helft van de tijd maar één draad. Omdat er nu acht stapjes zijn, zal de motor niet gemakkelijk schokken en de beweging is heel erg vloeiend. Maar op deze manier haal je niet de maximale kracht (koppel) uit de motor (70%). Dat kan je wél met de tweede manier uit de tabel. Full stepping wil zeggen dat altijd twee van de vier draadjes onder spanning staan. Nu bereikt de motor zijn maximale koppel. De vierde manier , Microstepping, vraagt dure elektronica om de motor te besturen, dus daar houden we ons zeker niet mee bezig. Wat me nu vooral bezighield was toch wel de nauwkeurigheid en het koppel. Niet dat ik zo'n zware objecten in beweging wil zetten, maar de nachtmerrie bij het besturen van een stappenmotor is het feit dat ie stapjes overslaat omdat de belasting te groot is. Je merkt dat niet op het eerste gezicht, maar als je bijvoorbeeld de motor exact 46,7° wil draaien in één bepaalde richting, dan is dat van levensbelang. En de toepassing in mijn hoofd heeft nood aan zo'n nauwkeurigheid. Als dat met een onderdeel van 2,5$ zou kunnen, dan zou ik daar heel erg vrolijk van worden. Eerst en vooral, en dat was voor mij belangrijk om weten, de motor verbruikt een stroom van rond de 120mA in half stepping. Bij full stepping zal dat in principe 160mA zijn, maar dat heb ik niet getest. Maar het was hem te doen om de belasting en snelheid. Een koppel van 300 gcm kan je nameten door aan een hefboom op de motor een gewicht van 300g op één centimeter van het midden van de rotor de hangen. Als de motor dat aankan, is ie dus sterk genoeg om dat koppel te leveren. In de praktijk is dat te moeilijk, dus ik neem een hefboom van 10 cm en een gewicht van 30g. 300gcm haalde hij dus makkelijk, bij 350gcm begon de motor te sputteren (hij miste stappen). Dit gebeurde bij een snelheid van 333pps (pulses per second in sommige datasheets) of 3ms tussen de pulsen. Bij deze snelheid duurt één omwenteling 12,6 seconden. Ik heb de snelheid opgedreven tot 500pps (2ms vertraging tussen de stappen), maar dan kon de motor ook niet meer volgen. De maximale snelheid zonder belasting was bij mij zo'n 800 pps (1,2 ms delay of 5,0 seconden voor één omwenteling). Bij hogere pulsen valt de motor helemaal stil. Full stepping heb ik buiten beeld ook uitgetest, en het maximum koppel dat ik kon halen was 380gcm bij 333pps (3ms delay). Met deze laatste cijfers haal je dus het meeste kracht uit de motor, maar het is niet de aangeraden manier van besturen. Waarom precies weet ik niet, het staat gewoon zo in de datasheet. Het aantal stappen per omwenteling is een beetje een mysterie. Ik vond verschillende waarden online terug, maar de testjes die ik deed gaven telkens 508 of 509 aan. Bij 508 haalt ie net geen volledige omwenteling, en 509 is dan weer iets meer dan 360°. De waarheid ligt dus in 't midden, alleen is het vreemd dat dit niet op een geheel getal uitkomt. Het feit dat er een sterke vertraging ingebouwd zit, heeft er wellicht mee te maken. Er zijn blijkbaar ook verschillende versies van dit motortje te vinden, en de vertraging variëert van model tot model. Hier vond ik een topic dat dit vreemde gedrag aankaart. Er komt nog een behoorlijk groot probleem bij, en dat is het feit dat ik een speling meet van wel 6° op de rotor. Dat komt natuurlijk door die tandwieltjes en daar kan je weinig aan veranderen. Ik ben van plan om dit softwarematig te omzeilen door slechts in één bepaalde richting te draaien om een juiste positie te bepalen. Als de motor toch een exacte positie moet innemen in de andere richting, laat ik hem eerst 10° terugdraaien om zo telkens in dezelfde draairichting de motor te stoppen. Je kan hier mijn Arduino code bekijken. Er zijn vier functies voorzien die je kan kiezen in het hoofdprogramma loop() door ze uit commentaar te halen. De standaard functies voor half stepping heten forwards() en backwards(), de full stepping varianten heb ik forwardsFull() en backwardsFull() genoemd. Vorige keer werd de vraag ook al gesteld, en ook in mijn eigen hoofd kwam ze wel vaker naar boven. In de negen maanden dat ik nu een uitkering krijg, kwamen er nog nooit controleartsen aan te pas. Ik hoor wel vaak andere verhalen hoor, en die zijn niet van de poes. Zowel de verhalen als de controleartsen. Maar op die controle, die trouwens enkel administratief was maar wel ter plaatse moest gebeuren om vast te stellen dat ik écht niet aan het werk ben, stelde de man dus die vraag die ook in mijn hoofd al lang speelde. Waarom word ik toch niet opgeroepen bij de conrolearts? Ik kon er geen antwoord op geven, en de RSZ controleur vond het ook een uitzonderlijk vreemde situatie. Hij bezocht me vorige week, en ik ben werkonbekwaam sinds acht januari. Dus negen volle maanden zonder dat er enige vraag werd gesteld. Nu was het dus wel zover. De uitnodiging kwam dus zeker niet onverwacht. Ook de verhalen die ik hoorde bleken eerder cowboyverhalen te zijn. Dat ik me kon verwachten aan nogal assertieve, éénzijdige en belerende gesprekken werd onmiddellijk ontkracht. Ik werd ontvangen door twee artsen, toch niet meteen geruststellend. De tweede arts was misschien gezien zijn jongere leeftijd aanwezig om iets op te steken, maar dat werd niet vermeld. De kemels heb ik er zelf moeten uithalen. De hernia's waren dus nooit cervicaal (de vraag "hoe gaat het nu met je nek" leek me al zo vreemd toen ik binnenkwam). Dat ik geen Lantus meer spuit en dat mijn Novorapid nu in een insulinepomp zit, stond nog niet juist aangevuld in de historiek. Ik heb ook bevestigd dat ik die pomp op dat moment bij me had (euhm... ??). Beide artsen waren gefascineerd door deze technologie en de glucosesensor deed er een behoorlijke schep bovenop. Waar die dan aan mijn lijf plakte en hoe ik dat kon aflezen op een soort kleine iPod, ik heb het allemaal uitgelegd. De medicatielijst had ik niet bij. Ik bezit dat ook niet en de lijst varieert ook bijna wekelijks. Daarom had ik dan maar de pillen zelf bij. Targinact was niet gekend. Niet bij dokter A, en B wist het ook niet. Toen ze het pijnstillend ingrediënt Oxycodon hoorden en de dosis hadden afgelezen op het doosje, vroeg dokter B of ik daar niet van de wereld van was. Ik kon dat wel bevestigen maar gebruikte meteen de woorden dat werken op Oxycodon - zeker met het werk dat ik doe - geen optie is. Nog even bespraken we het feit dat er een bijkomend probleem is, want als freelance programmeur kom ik bij de klant werken en als je geen voertuig mag besturen, lukt dat dus niet. Nog even gaf ik het voorbeeld van de twee kemels van vorige week. Onder de MRI scan had ik mijn glucosesensor niet uitgedaan. Dat kan dramatisch zijn voor de zender en ik was na de foto bang dat ik 300€ zou kunnen neertellen voor een nieuwe zender. Gelukkig kwam het ding een uur of 4 - 5 later toch weer online. Het tweede incident gebeurde voor ik de tunnel werd ingeschoven waar de stralen mijn binnenkant in beeld gingen brengen. De dame stopte me het blad dat ik net had ingevuld in mijn handen. De vragen die ik met ja/nee moest aankruisen, hadden tot in de helft van het blad een antwoord gekregen. De rest was leeg gebleven, maar onderaan het blad was ik weer helder genoeg om de datum in te vullen en te bevestigen dat wat ik net had aangekruist juist was door een handtekening te plaatsen. Op zich klopte dat ook, alleen was er dus een half blad maagdelijk wit gebleven. Dat moest eerst verder aangevuld worden, anders mocht ik niet in de tunnel. Om maar te zeggen: ja, het heeft invloed op mijn brein en neen, ik zou zo nooit software kunnen schrijven. Waarom het nu zo lang had geduurd voor ik werd opgeroepen? De dokter volgde me echt wel op de voet. Normaal zou ik na de operatie drie maanden revalideren, dus eind augustus kon hij verwachten dat ik weer aan 't werk zou kunnen. Omdat dat toch niet gebeurd was, moest ik even de reden daarvoor verduidelijken. Waarom ik dan een beetje ongerust was over deze ontmoeting weet ik niet. In elk geval, alles is in orde natuurlijk. Hij volgt me wel op de voet, en ook het bezoek aan de chirurg nu vrijdag wil hij zien verschijnen in zijn dossier. Ah, er was dus ook een medisch onderzoek, moest dat nog niet duidelijk zijn. Hij stelde vast dat mijn rug bijna helemaal geblokkeerd was. Dat was uiteraard niet nieuw voor mij, maar als je een maandelijks bedrag krijgt moeten de puntjes even op de i, dat lijkt me normaal. De echte vraag stelde ik me niet. Enkel diegene die ik zoveel jaren geleden constant stelde. Ze was van levensbelang voor me en als ik er nu op terugkijk, weet ik dat dat net de reden was waarom ik ze nooit kon beantwoorden. De vraag letterlijk stellen doe je niet. Nee, correctie! Dat deed ik niet. Geen enkele 'sociale drinker' stelt zich letterlijk die vraag rechtstreeks. Hij doet het met een omweg omdat ie de echte vraag, "Ben ik alcoholist? ", niet aankan. De woorden 'sociale drinker' horen trouwens zo tussen aanhalingstekens te staan. Dat doe ik altijd bij woorden die niet echt bestaan. Mijn eerste psycholoog verduidelijkte me het op dezelfde manier: een 'sociale drinker' is een drinker die dat in een sociale context doet. Op die manier koppelde hij de betekenis van de woordcombinatie los, en bleef de waarheid over. Als een 'sociale drinker' in de eerste plaats een drinker is, dan is de algemeen aanvaarde betekenis dat een 'sociale drinker' nooit een probleem heeft, onderuit gehaald. De strikvraag zou mijn leven kunnen redden. En ze is veel eenvoudiger omdat het antwoord, als het zou bestaan, mij eeuwige gemoedsrust zou geven. De strikvraag is : "Vanaf wanneer ben ik alcoholist?". Je zou dan in de simpelste vorm een aantal glazen bier of wijn (of porto, martini, cognac, wodka... naargelang in welk tijdsvak van mijn leven ik op dat moment klem zat) kunnen noteren als antwoord. Dat zou toch zalig zijn? Meteen zou je probleem volledig opgelost zijn. Je zou opnieuw sociaal kunnen drinken zonder je schuldig te voelen. Alles wat je zou moeten doen, is gewoon onder die limiet blijven. Drink niet meer dan x glazen op één avond en je hebt geen probleem. Het is een strikvraag omdat ze natuurlijk niet kan beantwoord worden. Ze gaf aanleiding tot de eindeloze lijst uitvluchten om mijn drankverbruik aannemelijk te laten klinken. Af en toe mag je je toch eens laten gaan? Of zoals een bekende alcoholiste het zo mooi formuleerde: "ik ga toch niet leven als een non". Waarmee ze natuurlijk bedoelt wat ik bedoelde: je gaat me toch niet het recht ontzeggen om me af en toe lazarus zat te drinken. Op de momenten die binnen mijn schema passen, moet het gewoon kunnen. Het schema stond niet op papier, het kwam erop neer dat situaties me het recht gaven. Iets drinken als je stress hebt, doet toch iedereen? Of om iets te vieren. Of zoals ik dat nu telkens vertaal: omdat het namiddag is, of omdat de zon schijnt. Pas op, ook bij regen vond ik een goede reden. De strikvraag is nu net de laatste dagen brandend actueel. Het komt door mijn recente bezigheden in verband met Google zoekwoorden. Ik kom nu vaak alle andere zoekwoorden tegen die aangekocht worden om mensen die met die vraag worstelen naar een site te lokken. Als je mijn banner ziet verschijnen, staat ie meestal tussen zelftesten en brochures die proberen een antwoord te geven op de vraag die geen antwoord heeft. "Wanneer ben ik alcoholist?" probeerde ik hier al eens te beantwoorden. Maar in het antwoord staat geen aantal glazen, op die manier werkt het niet. Waarom ik dan de echte vraag niet aankon? Omdat het antwoord ja was, natuurlijk. En dat betekende dat er maar één oplossing was: nooit meer alcohol drinken. Ik kon dus de vraag niet aan omdat ik het antwoord niet aankon. Stel je voor: moeten beloven dat je nooit nog alcohol drinkt? Ik mag er niet aan denken! Daarom zit ik in de AA. Wij doen die belofte slechts voor één dag. En die belofte kan ik nét aan. 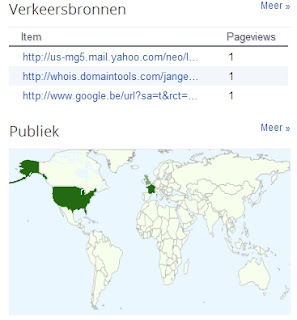 Je kan niet alles, maar wel veel afleiden uit de statistieken van Blogger. Het spreekt voor zich dat ik daar dan ook geregeld naar ga kijken, hoe zou je zelf zijn? Don't worry, veel info krijg ik niet. De meeste info is nogal technisch en het zegt normaal niks over de gemiddelde surfer die hier terecht komt. Ik ben de NSA niet, dus dat soort technieken beheers ik (jammer genoeg) niet. Maar soms zie je toch opvallende dingen. Normale dingen hoor, maar dingen waar een verhaal achter zit. Ik weet nooit alle details, maar er is één bepaalde link that really freaks me out. Ken je een WHOIS server? Dat is een server die achterhaalt wie de eigenaar is van een domeinnaam. Het is een proces dat alle servers ondervraagt vanaf de nieuwsgierige tot hier in een instantie hier in Brussel die de Belgische domeinnamen beheert (dns.be). Als er een whois aanvraag wordt gedaan, dan is dat altijd een persoon (geen zoekmachine) die dus op zoek is naar mij. En daar krijg ik dus de kriebels van. Het geeft een gevoel alsof er over mij geroddeld wordt. Je weet niet voor welke reden de persoon het doet, dus of het gaat over roddelen weet je niet. Je moet namelijk minstens met twee zijn om te roddelen. Misschien is het dus vaak gewoon uit nieuwsgierigheid dat iemand dat opzoekt. Niet omdat iemand heeft gezegd: seg, die jangeox... weet jij wie dat is? Waarop degene die de vraag wordt gesteld achter zijn PC duikt en opzoekt welke echte persoon er achter de domeinnaam zit. Gisteren dus wel! En deze statistiek zegt het. Het lijkt veel bla bla, maar het is een statistiek van de bezoeken van het afgelopen uur. Eerst is er iemand die een e-mail ontvangt waar een link inzit naar een pagina op mijn blog. Dat is die mail.yahoo link. Dan zoekt ie op wie ik ben op de tweede link. De derde lijn staat er los van. De reden waarom ik er nu meer mee bezig ben, is natuurlijk ook omdat er nu euro's mee gemoeid zijn. 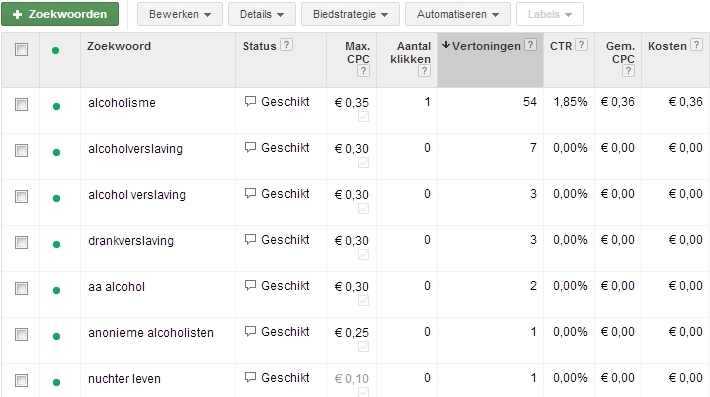 Niet veel, maar ik ben wel benieuwd hoe lang het duurt voor mijn 10€ aan advertentieruimte opgebruikt is. En ik ben vooral benieuwd of ze gedekt wordt door de opbrengsten van de advertentieruimte die ik zelf aanbied. Dat ziet er wel goed uit, en vandaag kwam ik in elk geval uit de kosten. Eerst heb ik de kost per klik moeten verhogen, anders verschijnt mijn website nooit tussen de zoekresultaten. Maar vanmiddag was mijn blog dus al 54 keer verschenen bij het zoeken op het woord "alcoholisme" op Google. Het houdt mensen dus wel bezig precies! En dit zijn dan nog enkel resultaten in Vlaanderen. En er werd inderdaad één keer op mijn link geklikt. Dat heeft me dus 36 cent gekost. 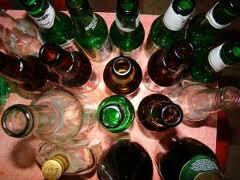 Het valt ook op dat het zoekwoord veruit het beste is blijkbaar, de nummer 2 is "alcoholverslaving" met slechts 7 vertoningen. Maar ik ben vooral benieuwd naar de resultaten op langere termijn natuurlijk. Dit is een statistiek van deze voormiddag, dus één persoon die geklikt heeft op 27 vertoningen, dat zal wel behoorlijk slechter worden mettertijd. Nog ééntje om het af te leren. Je kan ook de domeinnaam van de server zien die de bezoeker gebruikt. Nu is dat meestal telenet.be of belgacom.be, dus daar hebben we niet veel aan. Maar af en toe is er wel iets herkenbaar. Zo was er in augustus 21 keer bezoek van een leverancier van glucosemeters. En dan nog niet van mijn merk! Bij de insulinepomp was het wel zo, maar ook de concurrent kwam kijken. Mijn eigen ziekenhuis ook trouwens, ik stel me vanaf nu de vraag of mijn team meeleest. Er was wel wat om te doen toen deze zomer het nieuwe televisieseizoen werd aangekondigd. Commerciële kanalen gingen nu ook eigen producties in beeld brengen van het televisiegenre scripted reality. VTM kwam met Echte verhalen: De Kliniek, op Vijf TV werd het Waargebeurd: alles uit liefde en op Vitaya werd het De Waarheid. Uit Nederland kwam Beschuldigd en Achter gesloten deuren overgevlogen. Het principe is nogal basic: je stript alles uit een echte realityreeks, behalve het verhaal. Er is dus geen massa beeldmateriaal meer nodig. Je hoeft niemand nog een gans jaar op de voet te volgen om dan af en toe te hopen dat je één minuut leuke TV kan opnemen. Je huurt gewoon acteurs in en die spelen een leuk verhaal na. Maar het is op zo'n manier gefilmd dat het lijkt alsof het echt is op dat moment. Alleen, daar heb ik het nogal moeilijk mee. Het valt namelijk behoorlijk op dat alles in scène is gezet en de makers doen een beetje veel moeite om het te verdoezelen. Sommige cameratechnieken die men in reality uit noodzaak gebruikt, worden hier nagespeeld. Alleen voelt het allemaal behoorlijk nep als je weet dat het is nagespeeld. Zo zie je bijvoorbeeld vaak dat één van de acteurs de camera wegduwt, of dat ie schreeuwt dat ie nu niet wil gefilmd worden. Of je ziet een ruzie tussen man en vrouw door het keukenraam gefilmd omdat de crew zogezegd niet binnen mag in het heetst van de strijd. Alleen, als je wéét dat het gespeeld is - men maakt er ook geen geheim van - dan voelt dat toch allemaal wel heel erg nep aan. Als de dokter in De Kliniek een infuus aanbrengt, dan rommelt ie wat met een naald terwijl er een grote witte handdoek over de arm van de patiënt ligt. Bij een operatie zie je de dokter met mondmasker zeggen dat ie nu de wonde gaat hechten, maar je ziet natuurlijk niks want de patiënt speelde een uur geleden in een andere scene de vriend van een jongedame met griepsymptomen uit aflevering 3. En zijn buik ligt natuurlijk helemaal niet open, dat zou niet netjes zijn voor het budget en zeker niet voor de acteur. De makers hebben er niet op gerekend dat ik die afleveringen vaak per 3 of 4 stuks na elkaar zie op de digicorder, en dan valt zo'n gebrek aan cast meteen wél op. In De Waarheid bootst men het privé gesprek na dat de acteur 's avonds voor de eigen draagbare camera heeft. De bedoeling is wellicht om het dagboekkamergevoel van Big Brother op te wekken. Ofwel de zelfgefilmde dagboekscènes uit afvalprogramma's waar men the biggest loser enkele maanden volgt. Alleen gebruikt men nu een GoPro camera die op de spiegel plakt. Probleem is dat de kwaliteit van de camera te goed is. Ik heb er namelijk zo eentje liggen, en mijn Youtube filmpjes in HD hebben geen beeldruis en zelfs een hogere resolutie dan wat het badkamergesprek toont. Er is dus achteraf digitaal wat mee gemorreld om de kwaliteit slechter te maken, zodat we denken: aha kijk, ze heeft dit zelf gefilmd. Alleen, dit is dus geacteerd en het was helemaal een kemel om de dame dan met een gewone camera te volgen om haar te zien binnengaan in de badkamer. Dit is bedoeld als dagboekscène na een lange dag van opnames met de echte reality crew, maar zo val je toch behoorlijk door de mand. Zit ik er nu zo fel op af te geven? Dan heb je minstens al door dat ik ze wél allemaal gezien heb, die slecht geacteerde afleveringen die precies gemonteerd zijn op de MacBook van de vriendin van de regisseur. Dat wil dus wel zeggen dat ze toch al bij al goed zijn. En eerlijk? Dat zijn ze gewoon! Het is heerlijk gemaakt en eens ik me over de schoonheidsfoutjes zet, is het gewoon zalige televisie en ik ben er meteen aan verslaafd. Het is zoals de allereerste aflevering van Thuis zien en denken: wat is me dat voor rommel. Maar na al die jaren kijk ik ook nog altijd. Er moet dus iets in zitten, in die scripted reality. Eens ik scripted eventjes vergeet, is het gewoon reality in het kwadraat. I love it ! Dat lukt toch helemaal niet, je kent me toch? Of je kent me helemaal niet en dan leg ik het even uit. Die uitleg vind je trouwens meteen terug als je deze pagina via Google bereikt hebt met een advertentie die ik betaald heb. Nu heb ik toch wel in één zin alles al gezegd wat ik op deze pagina wou zeggen zeker? Maar eerst een intermezzo. Wist je dat die advertenties akelig nauwkeurig werken? Nu moet je eens kijken hoe mijn blog er deze morgen uitzag op mijn PC. Geef toe, dit geeft de uitdrukking "de nagel op de kop" toch wel een nieuwe dimensie, niet? Maar ik ging nog eens kort uitleggen dat de rem kapot is. Het komt erop neer dat ik niks rustig aan kan doen, het is meteen alles of niks. Dat wil zeggen dat geduld er ook niet is, en zeker niet in die mate dat ik zou kunnen afwachten wat die advertenties gaan opbrengen. Wat weet ik ondertussen al wel? Dat ze genoeg zullen opbrengen om zelf een nieuwe campagne te starten. En dat is bij deze gebeurd. 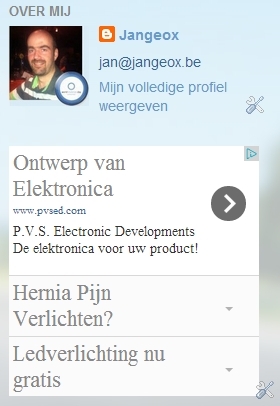 Als je één van die woorden ingeeft in Google, zal ik dus ooit ergens verschijnen als gesponsorde link. Als er iemand op dat vakje klikt in de zoekresultaten, dan moet ik daar dus voor betalen. In het overzichtje van de zoekwoorden kan ik zelfs een bod doen per zoekwoord, maar op dit moment staan ze allemaal op 10 cent per klik. 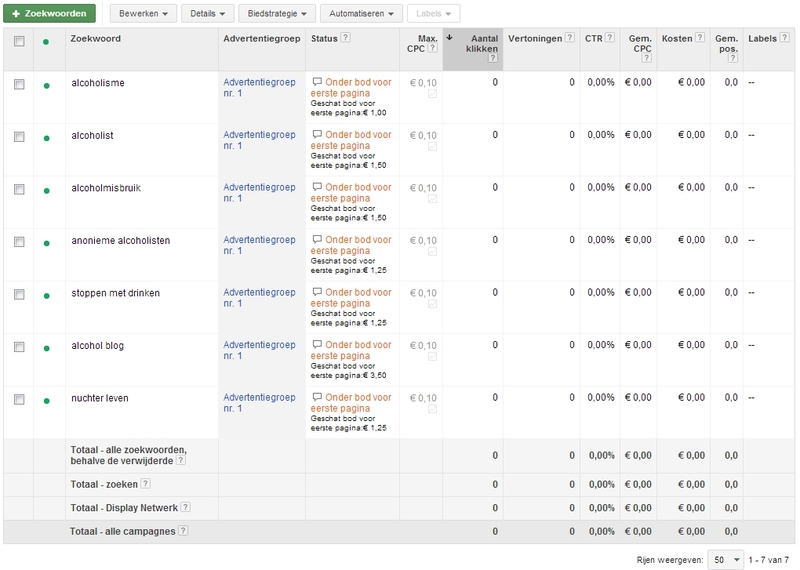 Dat is de kolom CPC (cost per click). Dat is natuurlijk weinig geld, en ik zal dan ook nooit bovenaan komen in zoekresultaten. 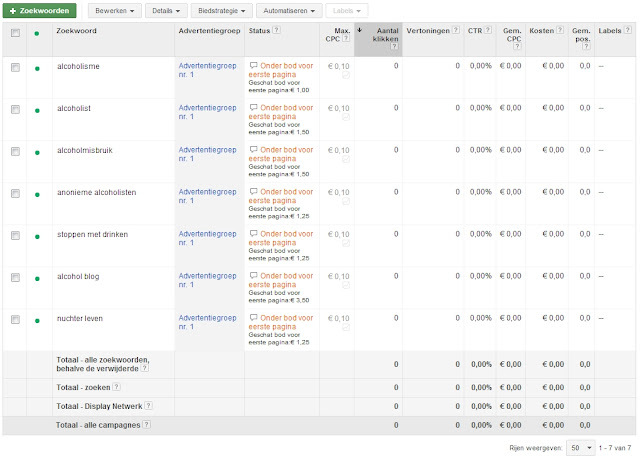 Mensen die echt producten verkopen om te stoppen met drinken bijvoorbeeld, hebben wellicht veel meer budget per klik op hun advertentie. Ik ben maar een kleine garnaal, maar we zullen zien wat dit geeft. In elk geval zal het nooit meer dan 30 cent per dag kosten, dus maximum 3 keer per dag mag iemand er op klikken. Als die limiet is overschreden, verschijnt de advertentie niet meer. Dan zou dat budget dus één maand meegaan. Tegen die tijd weet ik wel of de opbrengst er ook zal zijn, maar voorlopig ziet dat er best wel OK uit. Als iemand op mijn blog terechtkomt omdat ie bijvoorbeeld het filmpje van "my useless box" heeft gezien, dan ziet ie ook advertenties. De kans is groot dat die hem interesseren, want ze zijn ook gericht op elektronica. Als hij daar op klikt, genereert dat geld. Dat geld zorgt ervoor dat iemand anders die in Google "stoppen met drinken" ingeeft, ook op deze blog terecht komt omdat ik met het geld van de eerste adverteerder nu zelf adverteer op Google. 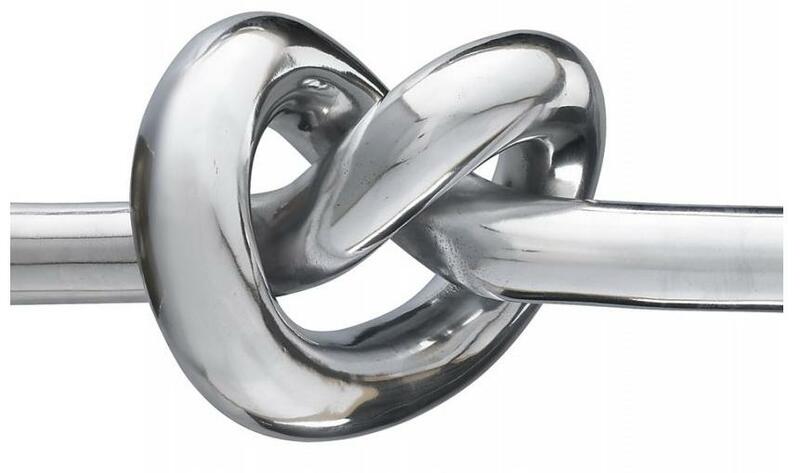 Er was een klein dilemma ontstaan, maar echt veel opties om te kiezen waren er niet. Vandaag had ik een sollicitatiegesprek en ondertussen was het behoorlijk lastig om dat in de praktijk geregeld te krijgen. Het dilemma heeft uiteraard alles te maken met de gezondheid. En dan uiteraard met het feit dat ze mank loopt. Dat kan je ook redelijk letterlijk nemen, merkte ik vandaag. Om te beginnen was het eigenlijk niet de bedoeling om dit te doen. Ik kan potentiële nieuwe werkgevers (of noem ik het nog klanten?) immers geen enkele redelijke termijn meer vooropstellen die ik nog nodig heb vooraleer ik de arbeid kan aanvatten. Je begrijpt dat dit geen klein probleem is als je op gesprek gaat. Ik heb dat dan ook meteen moeten uitleggen. Dat er iets mis was, had de interviewer natuurlijk meteen gezien. Ik kan het inmiddels niet meer verbergen dat ik moeilijk kan stappen. Waarom ik dan toch de afspraak had gemaakt was simpel: ze dateert van enkele weken geleden toen er nog wél een echte beschikbaarheidsdatum was. 't Is te zeggen, ik kon op z'n minst een reëel beeld geven. Maar terug naar het dilemma. Ik wist niet wat te kiezen: ofwel neem ik de medicatie die nu is voorgeschreven, inmiddels 2 maal daags 20 mg Targinact en kom ik met de trein naar het gesprek omdat ik geen voertuig mag besturen, ofwel neem ik deze ochtend geen Targinact en rijd ik er met de auto naartoe. Ik koos het tweede en dat was de goede keuze. Een ander punt is immers ook het feit dat je best met een helder hoofd naar zo'n gesprek gaat, en helaas is dat geen optie met dit medicijn. Nadeel was dus ellendig veel pijn overdag - het gesprek was inmiddels verschoven naar 15u - en een behoorlijke mankepoot toen ik aankwam. Het bedrijf heeft enkele trappen van de lager gelegen parking naar de inkom en ik kreeg meteen de vraag van een brave werknemer (dat vermoedde ik toch aan zijn kledij te zien) of het wel ging. Ik heb hem maar gerustgesteld dat het wel OK was. Zoals dat meestal gaat, kan je weinig zeggen over een eerste kennismaking. Ik heb plus- en minpunten en de gezondheid speelt uiteraard mee. Als ik in aanmerking kom, zal dat uiteraard enkel zijn nadat er meer duidelijkheid is. Die hoop ik volgende week te krijgen als ik de chirurg heb ontmoet. We hebben dan ook meteen afgesproken om die info door te spelen als ik aan de andere criteria voldoe. We gaan dus weer veel afwachten.